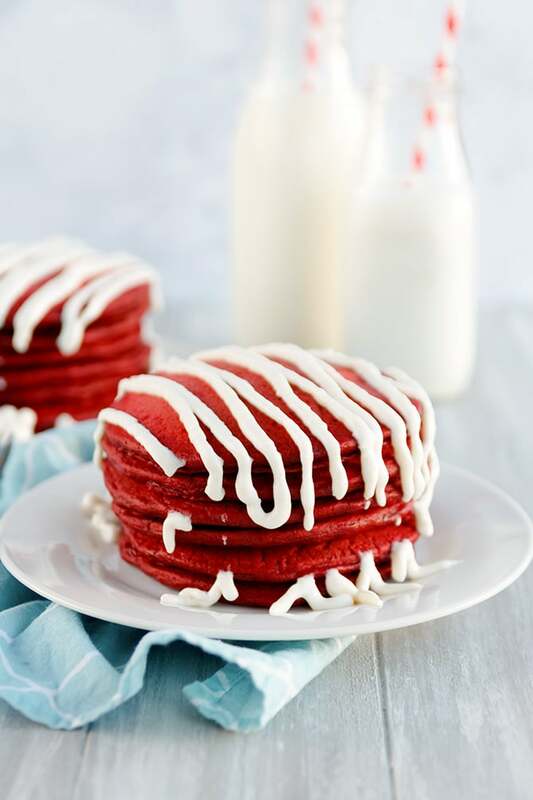 Homemade red velvet pancakes are the perfect weekend breakfast with a cream cheese glaze topping. I don’t consider myself a food blogger by any means. Though I do love to try new recipes and then blog about them, I am far from a food blogger. That being said, I am a horrible “wannabe” food blogger. It seems to me that all of my favorite food blogs anticipate the upcoming holidays and then create and blog about related recipes in advance. Obviously they should so that people can then make said recipe on the holiday suggested. Well, I fail big time in that area… and I’m ok with that. 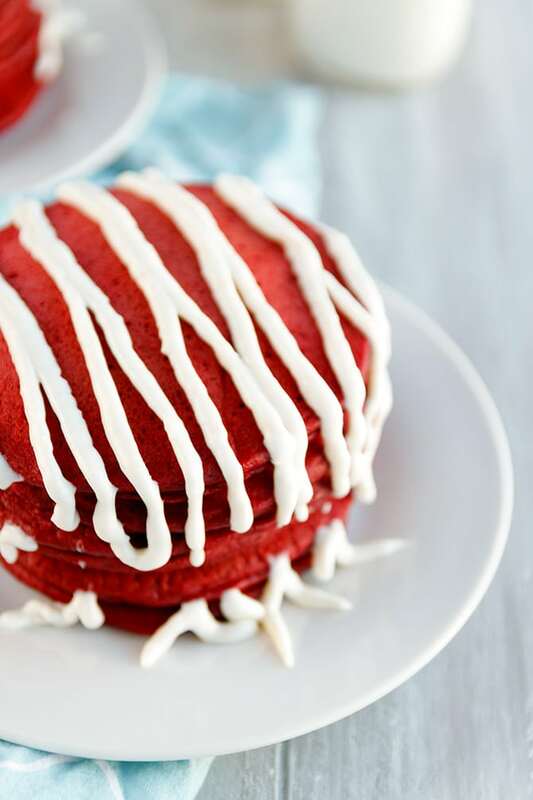 I made these beautiful red velvet pancakes on Valentine’s day. It is now a month later. Whatever. Oh wait, or am I extremely early for next Valentine’s Day? Or maybe Christmas since they are red? Anyway, red velvet is a huge love of mine. I’m not exactly sure what it is, but I love everything red velvet. Maybe it’s just because it’s chocolate that’s red that I like. Makes it prettier than just boring brown chocolate and I love pretty food. 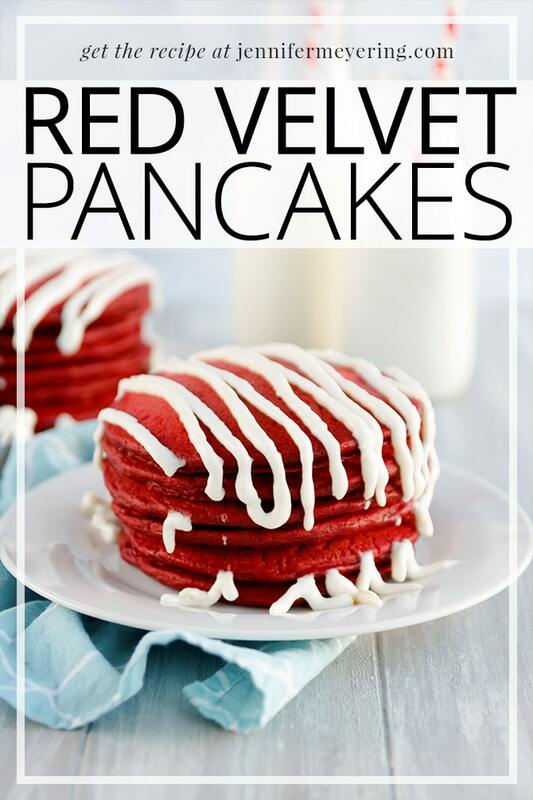 Either way, I am a red velvet fan for life and these pancakes are an amazing creation. Preheat electric griddle to about 325° F or medium and spray with nonstick cooking spray. In a large bowl, whisk together flour, sugar, cocoa powder, baking powder, baking soda, and salt. Add buttermilk, eggs, food coloring, vanilla, and melted butter and mix until combined. Scoop batter out by 1/4 cupfuls onto preheated griddle and cook just until edges begin to set and bubbles form on top. Flip and cook through, about additional 1-2 minutes. While pancakes are cooking, whisk together ingredients for cream cheese glaze until smooth. Add to small plastic baggie and snip off one corner. 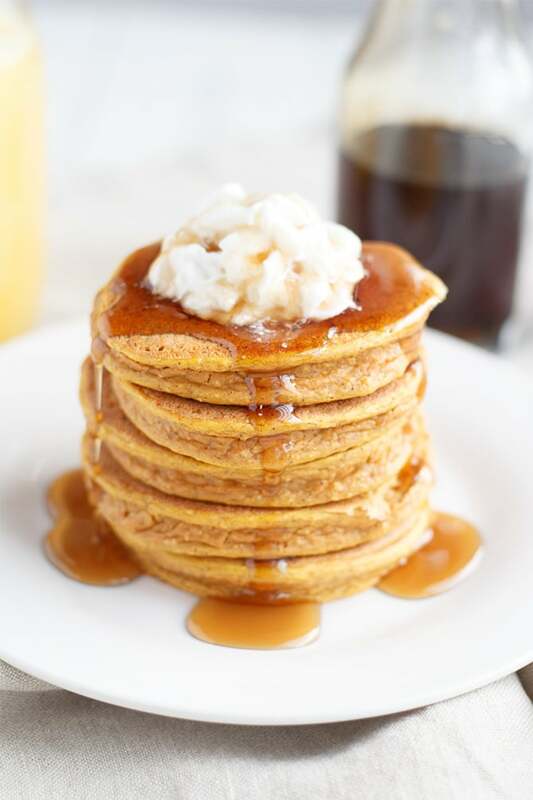 When pancakes are finished cooking serve immediately drizzled with glaze. Enjoy! Wow!! These are red! Stunning looking! Massive fail. The pancakes taste great, but they burned before they cooked, and they didn’t rise at all. Tried two different pans, tried different heat. Tried 6 inch pancakes, 2 T pancakes, and even 1 T pancakes. Flat–and burned before cooked. I cook all the time, so I am sure my baking powder and baking soda are date appropriate. I am open to the possibility of cook’s error, but I don’t think so…. No need to post this! I just wanted to pass on my feedback. I’m sorry that this didn’t work out for you. I’ve made this recipe countless times and always turn out for me. Hopefully you can find another recipe that works well for you.